wolfhirschhorn.org: The passing of the Torch Thanks for the great pics! Do you have a positively adorable photo of your child, that needs to be shared with the wolfhirschhorn.org community? If you do, we want it for the website. 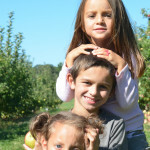 Over the next few weeks, we’ll be collecting photos of our kiddos to be used in updating the homepage of wolfhirschhorn.org. We know it won’t be hard to find great pics. The problem will probably be winnowing it down! – We want to reflect all moods, personalities and abilities, and both genders, in photos, so show us what you’ve got! – If you have access to hi-res or professional images of your child, that’s best, but not essential. – The larger the file size (1 MB or greater), the better. – Horizontal photos work best, so please don’t send vertical ones. – We prefer .jpg photo files, if at all possible. Looking forward to seeing your pics! Please provide by Aug. 25.You can email the photo/s to anitraschulte@gmail.com, or send the file/s via a file sharing site such as dropbox.com.